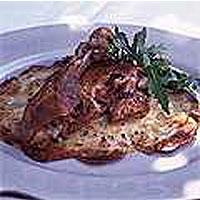 Confit, salted goose or duck poached slowly in fat, is best after a couple of weeks, when the flavour will have developed fully. Put the bay leaves in a coffee grinder with the thyme and blitz to a powder. Reserve. Scatter half the salt in a dish, then lay the duck on top. Rub the garlic all over the duck and lay it, skin-side down, on top of the salt. Scatter the herb mixture evenly over the duck, then sprinkle over the remaining salt. Refrigerate for 12 hours, then turn the duck over and return to the fridge for a further 12 hours. The salt will have liquified. Preheat the oven to 150°C/gas mark 2. Rinse the duck in cold water and pat dry. On the stove top, gently melt the fat in a casserole or ovenproof dish in which the duck pieces just fit. When hot, add the duck, which must be covered with fat; if it is not, add lard until it is fully covered. When just trembling but not boiling, put the dish in the oven and cook for 1 1/2 hours. Push in a skewer at the thickest point; it should slide in easily. If not, check again after 10 minutes. Transfer the confit to a plastic container, ladle the fat over the confit through a fine sieve, being careful not to ladel any of the juices from the bottom of the cooking dish. When cold, seal with a lid and refrigerate until needed. Preheat the oven to 200°C/gas mark 6. To serve, remove the duck from the fat, then place on a baking tray for 1 hour to come to room temperature. Pour off any melted fat from the tray and roast, skin-side down, for 20 minutes, turning it skin-side up to serve. Alternatively, fry over a low heat in a dry, heavy-based frying pan, starting skin-side down. Melt the stored fat from the container and bring to the boil before straining back through a sieve into a bowl to keep in the fridge to use for another confit. It can be used 3 times before it becomes too salty. This recipe was first published in October 1999.